HCG friendly and a little swanky for special occasions! This impressive dish includes your protein, veggie, and fruit. In a shallow glass dish, stir together the stevia, sea salt, vinegar, ginger, garlic, red pepper flakes, and chicken stock. Season fish fillets with salt and pepper, and place them into the dish. If the fillets have skin on them, place them skin side down. 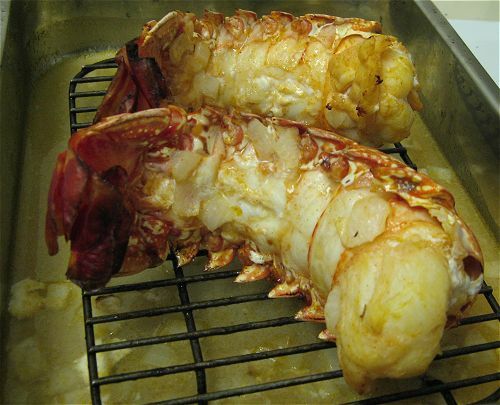 Cover, and refrigerate for 20 minutes to marinate. 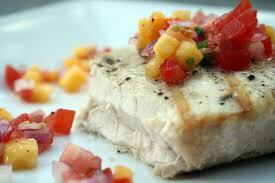 Remove fish from the dish, and reserve marinade. Bake swordfish in preheated oven about 10 minutes, until internal temperature reaches 140 degrees F.
Pour reserved marinade into the skillet, and heat over medium heat. Add tomatoes, lemon juice, cilantro, and peaches, then adjust season to taste. Spoon sauce over fish, and serve immediately. This entry was posted in hcg recipes, weightloss and tagged HCG, hcg recipes, weightloss, wellness on March 26, 2011 by Derma Darling. 1). Brown ground steak over medium heat in the beef broth. Add all seasonings and simmer over low heat for 10 minutes. 2). Finely chop the tomato and cucumber. 3). Pour beef with 2tbs broth into the lettuce bowls. Top with the tomato and cucumber then devour! This entry was posted in hcg recipes, weightloss and tagged hcg recipes, weightloss on March 18, 2011 by Derma Darling. That raging bull of hunger barrels through your conscience demanding to be lulled with a heaping slice chocolate cake, and you are defenseless! What’s a gal to do? 1). It maybe counter intuitive, but eating small meals (about 200-300 calories) 5-6 times a day will keep your blood sugar stable and prevent over eating. 2). Drink no less than 2 liters of water every day. Thirst is often mistaken for hunger! TIP: make your self finish the first liter before noon, then you have the rest of the day to sip. 3). Apples are a dieter’s best friend. 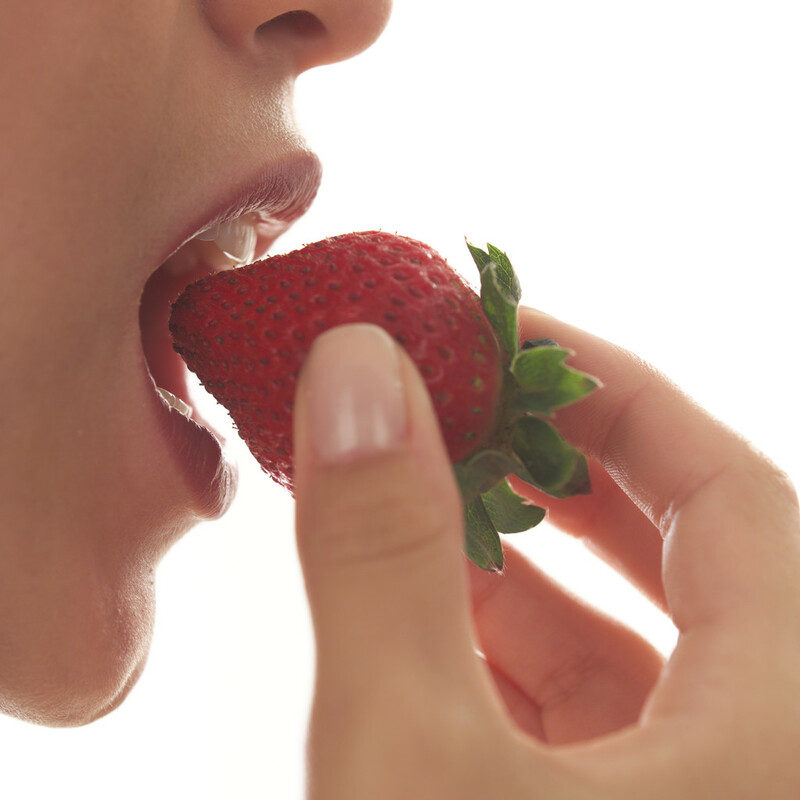 Munch on nature’s leading lady of appetite suppression as a snack to tame the beast till your next meal. 4). Green Tea makes the world go around for skinny gals. 3-4 cups a day will naturally help keep cravings at bay all the while increasing your ability to burn fat with its thermogenic effect. Scientists spill the beans that green tea chuggers oxidate fat at about 20% higher rate. 5). When all else fails. Cheat! 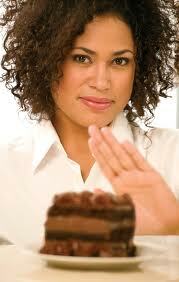 Phentermine spray is a low dose phentermine based appetite suppressant. 1-2 sprays under the tongue when cravings hit, up to 10 sprays a day, will control your cravings with out the jitters associated with phentermine pills. This entry was posted in hcg recipes, weightloss and tagged fat free recipes, hcg recipes, weightloss on March 17, 2011 by Derma Darling. 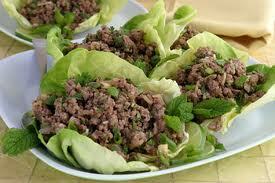 This delicious recipe uses lean steak as a replacement for the ground beef that we aren’t allowed on the HCG diet. Technically, we aren’t supposed to mix veggies if we are cooking them, but remember the zucchini is raw. Serves one skinny gal to be. 1. 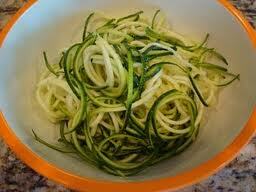 Julienne cut the zucchini and sprinkle with sea salt. Set aside. 2. Cook tomatoes and chicken stock over low/medium heat adding in the herbs and spices to simmer. 4. Add the beef to the tomatoes and cook until done. 5. 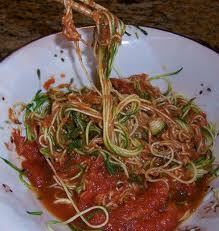 Pour your delicious spaghetti sauce over the raw zucchini noodles and toss. Enjoy!! This entry was posted in hcg recipes, weightloss and tagged hcg recipes, weightloss on March 12, 2011 by Derma Darling. Simmer all ingredients in saucepan then add shrimp. Cook 3 minutes or until shrimp is white through out. Turn down on low to simmer till time to serve. Makes 2 servings. Mix salad ingredients and dressing and refrigerate overnight. Serve with 1 melba toast. Savor! This entry was posted in hcg recipes, weightloss on February 15, 2011 by Derma Darling. 1. Stay very strict on the diet ~ any sugar indulgence will send your insulin levels into a tizzy and cause you to have more noticeable hunger. 3. Drink at least 3 cups of green tea per day. Not only do the catechins protect you from cancer, it speeds up the metabolism and suppresses the appetite. Your energy slump could also get a beating by this powerful antioxidant. 4. Do not go easy on the water! 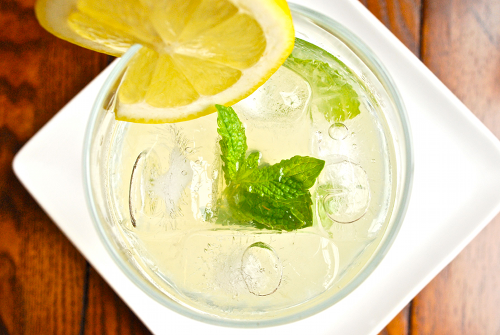 Minimum of 2 liters should be hitting your belly during the day. It fills you up, flushes toxins, and boosts energy. By the time you are thirsty ~you are already dehydrated. 5. Add B12 injections once or twice a week to boost your energy levels. If 9-14 lbs of fat loss in the first week is just not enough for ya, add Lipotropics to your B12 to enable fat metabolism to occur more efficiently. 6. Exercise is not mandatory on this program, so reserve your energy the first week. There is something to be said about not using up your glycogen stores! Keep in mind the first week is the hardest as you acclimate to the diet and HCG. The results are absolutely worth it. Stick to it and you will start to feel a sense of wellbeing before you know it. If you have any questions about the protocol, recipes, or want to know if something is on the list of things you can eat, please call your physician or nurse and let them be your support! This entry was posted in hcg recipes, weightloss and tagged HCG on February 8, 2011 by Derma Darling.